This is kimono - a traditional Japanese wear. We make kimono using unique patterns and techniques of Kaga region. Kaga Yuzen started in Muromachi period (1338-1573), and it can be traced back to Kaga's unique technique called Umezome (plum dyeing), wich was monocolor. In older days Kaga was a silk-producing region, and silk made in Komatsu city was known all over the country as Kaga silk. Kaga Yuzen came out of Kaga Zome, dyeing of that silk. Miyazaki Yuzensai, who was famous for painting folding fans in Kyoto, came to Kaga and started to dye clothes, thus the name of Kaga Yuzen was born. There are more than 10 stages of making, starting from a sketch on paper, and all of them are hand-made by craftsmen. 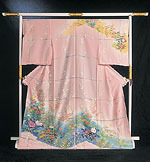 The unique feature of Kaga Yuzen is in its coloring and patterns. The coloring is made of 5 principals that are indigo, cochineal, yellow ochre, grass and Chilean purple, and it looks very rich but calming. The patterns are shapes of things seen in nature, and they are very colorful. These pictures are very realistic, richly showing the beauty of nature itself. For example, 3 shades of blurring are used to depict grass, or holes are left in leaves representing places eaten by insects.